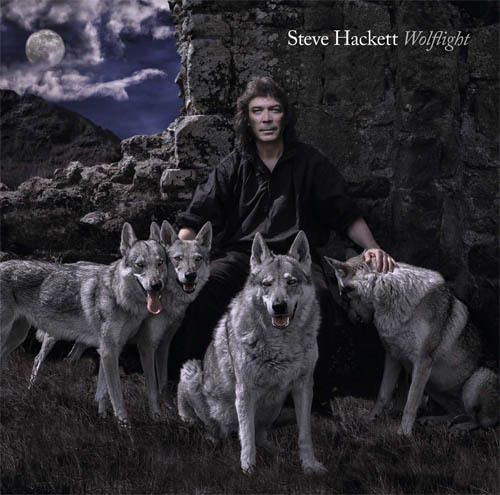 For renowned Prog-rocker Steve Hackett, going to age-old sources of inspiration has struck gold. We can be thankful he did—for my money, his new album Wolflight is easily the best original new work of music released in 2015. Not only has he drawn upon a diverse array of cultural influences for this masterwork, he’s gone straight to the wellsprings of Western culture in Greece and Central Europe. Not many rockers would even know where to look—in this case, an ancient cave near Delphi, where Greek oracles—usually priestesses—foretold the future. The steppes of Asia and its millennia-old horse culture also figure prominently on Wolflight. It helps that Hackett’s wife Jo is what he describes as a “Grecophile” and a historian. “She’s always telling me about the background of songs I did with Genesis, like Father Tiresius from Cinema Show,” Hackett says in the song-by-song DVD interviews accompanying the CD. (One of the rare times the DVD extras are worth watching.) The couple visited 20 countries over the past year or so in the course of bringing Hackett’s music to a global audience. ‘Wolflight’ gets my vote for Best Album of Original Material for 2015. Courtesy Hackettsongs. According to music journalist Steve Houk, “The term ‘wolf light’ was inspired by Homer talking about the hour before dawn when the dreaming mind is still active and the imagination roams alongside the prowling wolf.” Homer, of course, being not the Simpsons character but the ancient Greek poet who wrote two of the greatest epics in literature, the Iliad and the Odyssey. “The idea of the title is the hour before dawn where it’s a little bit like twilight but it’s slightly different, kind of grey,” Hackett explains. “If ever you’ve had to take an early morning car ride to get to an airport, or an illicit tryst, that colour will be well known to you. It’s quite extraordinary going from dark to light—again, much like the album does.” Indeed, ‘wolflight’ is an apt metaphor for inspiration itself. French poet Arthur Rimbaud called it the state of “complete disorientation” that writers often find the most productive for channeling new ideas. Here again there’s a link to the Delphic cave that inspired Hackett’s song Corycian Fire, where the ethylene gases once prevalent there put revenants into a state of heightened consciousness. Whether the artist’s vehicle of choice is a gas, a dream state, a stick of ganja or a single malt Scotch, the sought-after destination is the same—opening oneself to become a channel for what has been described as ‘the music of the spheres.’ Although often used in esoteric philosophy to describe the movements of celestial bodies, it’s an apt metaphor for the quasi-magical source of all artistic inspiration. 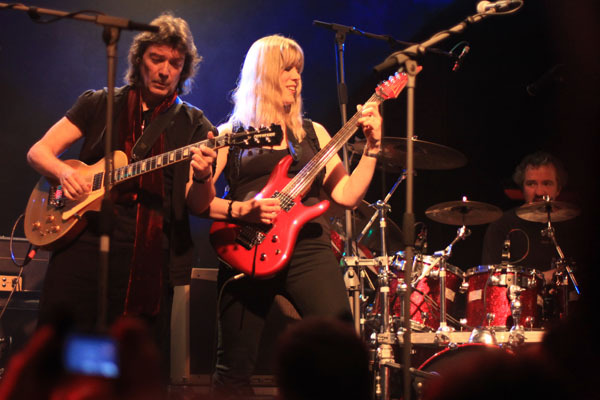 Steve Hackett performing with Amanda Lehmann and Gary O’Toole. Courtesy Hackettsongs. 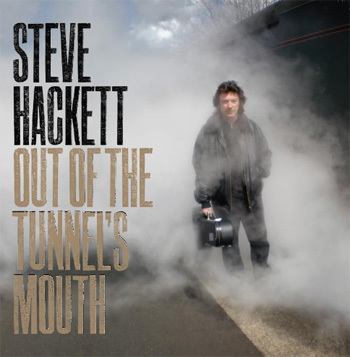 Hackett’s 2009 album ‘Out of the Tunnel’s Mouth’ is not to be overlooked. Courtesy Hackettsongs. Where in the past Hackett’s albums have taken an anthologist’s approach to world music influences—one song with echoes of the English folksong, one with Moroccan overtones, one with Spanish guitar and still another with driving hard rock—on Wolflight, his approach is of synthesis, often incorporating all of the above in a single track. Both approaches work well in the hands of a skilled craftsman like Hackett, the former approach most successfully on albums like the excellent Out of the Tunnel’s Mouth (2009) and Beyond the Shrouded Horizon (2011). Indeed, it seems Hackett’s music in the 21st century has rediscovered the laser-focused vitality and compositional originality of his earlier works, Voyage of the Acolyte (1975), Please Don’t Touch! (1978) and Spectral Mornings (1979). Peter Gabriel-era Genesis (Hackett on right): for my tastes, the defining era of the band. As Hackett aptly points out, “Progressive music was made for this reason, so you could go from genre to genre, you could cherry-pick all you wanted and leave behind all the rest.” This has been the great gift of the Sixties and Seventies, the obliteration of musical boundaries, freeing up musicians to do anything. But making it work—that takes a strain of genius, a term all too glibly thrown around these days. Making it last is yet another challenge. Hackett was a driving creative force in Peter Gabriel’s Genesis and many of the songs from that era easily meet the test of time four decades later. Just how influential Hackett was in the classic Genesis sound is evident when you listen to the drastic shift in musical direction after he left the band in 1979. But not before delivering two stunning post-Gabriel albums, A Trick of the Tail and Wind and Wuthering (both 1976)—classics in their own right. No wonder Hackett’s recent Genesis Revisited tours have seen sold-out audiences everywhere and requests for more. 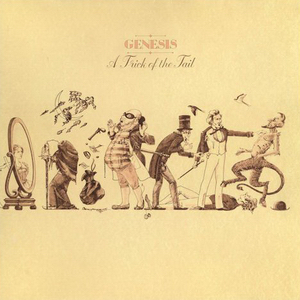 Post-Gabriel era Genesis struck artistic gold with ‘A Trick of the Tail’ and ‘Wind & Wuthering.’ Courtesy Wikimedia. A major part of the secret of Prog Rock’s success was the creation of the long-player disc (LP) in the 1960s, shifting the centre of musical gravity from the 45 rpm single to the album. As in so many other areas, the Beatles were the early pioneers of album rock with Sgt. Pepper and Magical Mystery Tour. The inception of FM radio was another boon to Prog Rock bands. With AM radio already covering the hit singles, early FM radio DJs created their own niche by playing album rock released by bands determined to create cohesive album-length works rather than just singles. I can still remember an FM radio DJ in the early ’70s putting on Pink Floyd’s Dark Side of the Moon from start to finish with no annoying interruptions of chatter or commercials. It was like the early days of YouTube before they began destroying the continuity of albums with ads. Prog Rock artists were more in the tradition of classical composers than of Elvis or Chuck Berry, using the LP and new multi-tracking studio technology to stretch out their compositional skills. (Many Prog rockers were in fact classically trained musicians.) Instead of the ‘wham-bam, thank-you ma’am’ three- to four-minute hit song, album rock took you on a journey, using instrumentation to create a gradation of moods, just as for example Beethoven’s 9th Symphony does. It also allowed musicians to explore sociopolitical themes in much greater depth. Prime examples include Dark Side of the Moon, Emerson, Lake and Palmer’s Karn Evil 9, Eloy’s Ocean, and lesser-known classics like Klaatu’s Hope—a brilliant post-apocalyptic musical narrative. Of course, listener access to such works presumed at least a basic level of education in literature, something that seems to be in decline. Combine that with the exponential proliferation of musical genres and media splintering at the end of the 20th century, and it appeared audiences have lost the attention span for such album-spanning works. The final nail in the coffin appeared to be the emergence of social media, whose neurological impacts on mental concentration are only now coming into focus. But to corrupt an axiom coined by Mark Twain, rumours of Prog Rock’s death are greatly exaggerated. In fact, a whole new generation of Prog rockers appears to be doing quite well—Norway’s Magic Pie, Poland’s Riverside and Britain’s Haken, to name only three. Klaatu’s ‘Hope’ is a lost gem of the Prog Rock tradition. Courtesy Wikimedia. To quote the good Doctor Frankenstein: “It lives! It lives!” Prog lives! NOTE: Despite the length of this post, for those of you interested in the nuances of musical composition it’s worth reading more from Mr. Hackett in the following interviews. This entry was posted in Music, Rock 'n Roll and tagged Dark Side of the Moon, Emerson, Klaatu 'Hope', Lake & Palmer, music, Peter Gabriel-era Genesis, Prog Rock, rock, Steve Hackett. Bookmark the permalink.